Aquarium senior educator Jo Blasi is on expedition to Antarctica to study the impact of climate change in these areas and changes in the marine ecosystem. She will be live blogging frequently about the expedition, research technologies and marine life encountered during the trip. No more than a half mile from Palmer Station is Torgersen Island, a small rocky outcrop near the entrance to Arthur Harbor. The island was named back around 1954–1955 by first mate Torstein Torgersen (b. 1918) during a charting expedition aboard the Norwegian sailing vessel Norsel. Ride alongside Jo as she jumps on a zodiac and heads over to the island for the very first time! Back in the mid-1970′s Torgersen Island was home to roughly 9,000 breeding pairs of Adélie penguins (Pygoscelis adeliae). The island was an absolute mass of life! Since then, climate change has decreased the breeding pairs by 81 percent to 2,500. Jo got to witness these animals first hand. See more pictures of Adélie penguins by Aquarium Explorer-in-Residence Brian Skerry here. 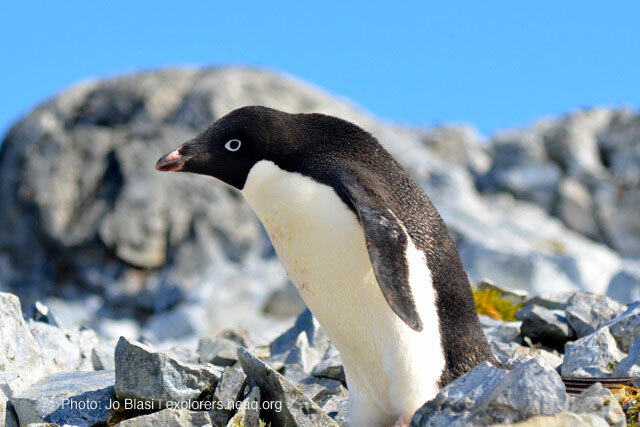 And brush up on your penguin species with our handy penguin species guide. All of Jo's entries will be cross posted on the Palmer Long Term Ecological Research Station site here. Track her progress on the R/V Gould, and learn more about the Palmer Long Term Ecological Research Station. I love the sound the Adélies are making! What does it smell like there!? Antarctica Expedition: Oh the Pressure! Antarctica Expedition: Palmer LTER's Robots!